The Striding Lion, symbol of Ishtar from the Wall of Processional Way in Babylon, built by Nebuchadnezzar II. Elizabeth Goodine's great gospel song, When Jesus Lifts the Load, performed here by the Christs Church Choir with the Gaither Vocal Band. Heavenly Father, you take no pleasure in wickedness and evil has no place in your kingdom; the boastful will not stand in your sight. You hate all the workers of evil. You destroy those who lie and defraud; you abhor the bloodthirsty and deceitful. Bless me that I will not be among them, for I would come into your house in the multitude of your mercy. In fear of you and in the hope of mercy, I worship you. Lead me, O Lord, in your righteousness. Make Your way straight before my face. Let all those rejoice who put their trust in you; let them shout for joy, because you defend them; those who love your name, grant them mercy and joy. 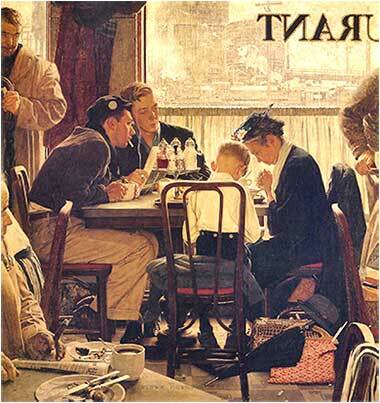 Saying Grace by Norman Rockwell, ca. 1951. And in the ninth year of his reign, in the tenth month, on the tenth day of the month, Nebuchadnezzar king of Babylon came with all his army against Jerusalem and laid siege to it. So the city was besieged till the eleventh year of King Zedekiah. A breach was made in the city, and all the men of war fled by night by the way of the gate between the two walls, by the king's garden, and the Chaldeans were around the city. But the army of the Chaldeans captured the king and brought him up to the king of Babylon at Riblah, and they passed sentence on him. They slaughtered the sons of Zedekiah before his eyes, and put out the eyes of Zedekiah and bound him in chains and took him to Babylon. Nebuzaradan, the captain of the bodyguard of the king of Babylon, came to Jerusalem. And he burned the house of the Lord and the king's house and all the houses of Jerusalem; every great house he burned down. And all the army of the Chaldeans broke down the walls around Jerusalem. And the rest of the people who were left in the city and the deserters who had deserted to the king of Babylon, together with the rest of the multitude, Nebuzaradan the captain of the guard carried into exile. And the pillars of bronze that were in the house of the Lord, and the stands and the bronze sea that were in the house of the Lord, the Chaldeans broke in pieces and carried the bronze to Babylon. What was of gold the captain of the guard took away as gold, and what was of silver, as silver. And the captain of the guard took Seraiah the chief priest and Zephaniah the second priest and [many priests and officers of the army] and brought them to the king of Babylon at Riblah. And the king of Babylon struck them down and put them to death. So Judah was taken into exile out of its land. The events recounted in the final chapter of 2 Kings occurred in 587-586 B.C. What is called Babylon and “the Chaldeans” is what historians call the “Neo-Babylonian Empire”. Babylon was ancient and had been the center of several very early empires of the Middle East. The first, that of Hammurabi, existed around 1700 B.C. A major problem for the casual reader of Middle Eastern history is that there were so many ethnic-linguistic groups, and they were not static, but would often group together; and if they became dominant in the region, their empire might be called by their capital city rather than the name of their tribe or nation. This is the case with the “Babylon” which sacked Jerusalem. 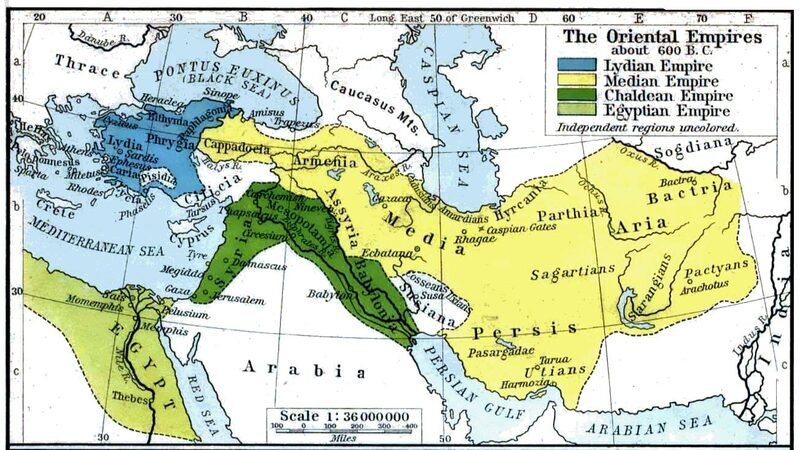 The Chaldeans had become the dominant group in Babylonia (in coalition with many other tribes). Moreover, their empire was practically co-extensive with the Assyrian Empire that had sacked Samaria and destroyed the Northern Kingdom of Israel. So that is why, at this period, we have the same empire attacking the Hebrews, but ruled by a different royal family living in a different capital city and called Babylon rather than Assyria. And also, why this empire is alternatively called the “Chaldeans”, the name of the tribe whose king (Nebuchadnezzar) ruled over it all. Chaldea was actually a tiny nation, but a land that is famous in the Old Testament for one reason: Remember when Abraham, the first patriarch of the Hebrews, left home and travelled to Canaan? Nebuchadnezzar was a hard and bloodthirsty king. He destroyed the Temple and looted it, melting down all of the finely crafted metalwork for bullion; he tore down the city walls and burned the houses; and he murdered most of the royal family and both military and religious leaders. He also transported the Jews of Judah to Babylon.